In ancient, war-torn China, hundreds and hundreds of men were called upon to defend their homeland. Unknown to all, there stood one female among the soldiers. 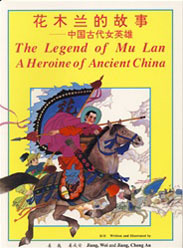 Disguised as her brother, in order to take her father's place in the army, heroine Mu Lan bravely defends her country with superior martial arts. Cheng An Jiang and Wei Jiang are an award winning father/daughter team of authors and illustrators who have published between them over one hundred children's books. 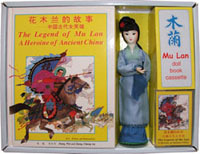 They have remade the classic Chinese poem of Mu Lan into an easy-to-read, vibrantly colored picture book.